But if your teams are working on 1–4 week iterations, getting out of the building to talk to customers, testing hypothesis and learning what works and what doesn't work, how can you use a static set of goals? - The answer is, you can't. 這顯然有什麼地方出錯了？理論上 OKR 的制訂必須跟組織和團隊的目標一致，而團隊成員就依據討論出來的組織目標去思考到底我們可以對組織有什麼貢獻？並且訂出一些覺得可以對組織有貢獻的改善方案當作我們的 OKR，但這個問題就來了，我們個人的OKR 如果沒有排入 Backlog 那有什麼時間可以做呢? 在 你真的了解OKR吗？ 這篇文章也有提到，所有的OKR 都必須排入Backlog 才能被有效追蹤和執行，但是Backlog 不都是PO 在管理的商業需求嗎? 那個人建議的改善方案要怎麼排進去呢? 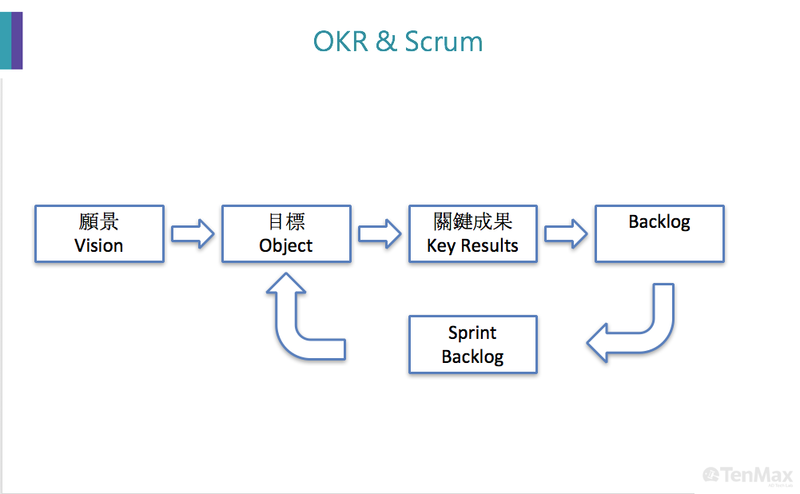 Should (or can) OKR's be implemented alongside SCRUM? How do software companies successfully conciliate the use of OKRs with agile sprints and deliverables? "company-level OKRs work fine, when it comes to group-level and individual OKRs, often developers get the feeling that the two systems are overlapping or even competing." Personally, I think OKRs fit better with pull based systems (e.g. kanban/lean) over push based systems (e.g. Scrum iterations). Autonomy is key. Once OKRs are set, it's great to see the team define their own work to help achieve their own OKRs. For example, let's say we want to release our recognition version 2.0 this quarter. This will be our OKRs. The key results will consist of the team member's sprints to achieve the goal. E.g. Redesigning the "Recognize" button, x amount of code reviews before push etc. 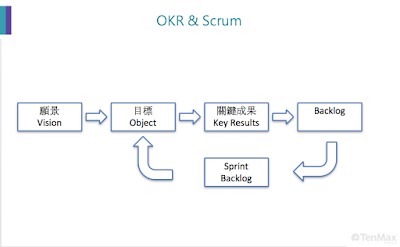 在 Agile Goal Setting with OKR - Objectives and Key Results 這篇文章中提到，透過團隊共享OKR可以達到 Reinforcing Alignment，這個觀點我認同，同一個team 對於同一個產品應該要有相同的目標和檢驗標準，不過這邊指 team 似乎不只是RD team還包含 BD sales 吧? Team 的 OKR 只需要專注在 交付嗎? 此外 A Key Result is NOT something you do, it IS something that happened because of what you did，所以我們要造成什麼Happen?